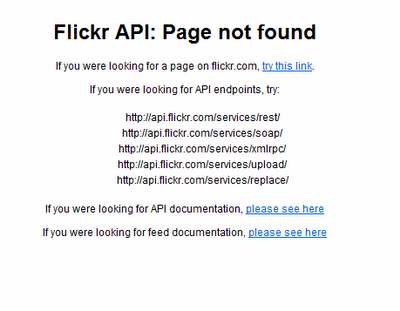 Dear Flickr, what the RSS hell? 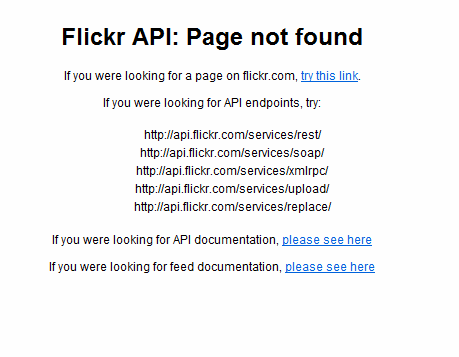 I tweeted about my disappointment with Flickr's integration with Facebook. It gave me nothing that Friendfeed didn't already do. I wanted a single upload that would sort things so the nice hi-res pictures appeared on Flickr and an adapted set appeared on Facebook so I could tag friends doing embarrassing things. I'm even more disappointment with their (lack of) RSS strategy. One of my Flickr feeds updated to say it wasn't going to update any more. Okay; 301 redirect it then like the rest of the world and we'll all carry on as normal. No. Looks like Flickr expects everyone to manually transfer. But where should we manually transfer too? The link they provided is this one. The problem seems straight forward. The URL ends with ?user_id=me. In other words; they expect me to be signed in (not that Google Reader can sign in for me). If I do sign in and try that URL again I get redirected. However, the URL I get contains a secret variable and I'm sure it's not wise to share its value. Maybe it's safe. Maybe it isn't. I've no idea. What Flickr need to do is simply and automatically upgrade the old public RSS addresses to the new public RSS addresses. It should be faff free.